Why didn’t anyone mention buffeting winds are not nice and pitching a tent upon top of a mount no matter how pretty, is not so wise? We did get more than bargained for when wanting excitement and Diderots predictions of the weather in Langres were really,really spot on. After our first night at this camp spot we lay in the tent procrastinating about wether or not to move on. Spread half in and out of the main door I felt the first warmth of the suns rays in uncountable months and the decision was made. We would stay one more night, dry off more and explore the town. Dry off we did, get wet, dry off some more. 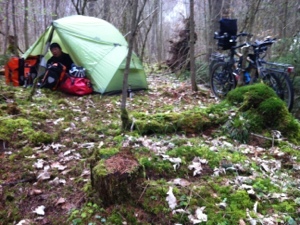 We again experienced all seasons before retiring to our tent for the night. Around about midnight we were both woken to the sound of gail forced winds. The tent shaking and bending in all directions. I popped up my head to check all was secure….did not pop outside as the wind was truly frightening. I did briefly consider what I would do if the tent was not holding and imagined undignified naked leg cartwheels over the precipice. I burrowed deeper into my sleeping bag. It rained and it blew and at times the fabric lay almost flat against us before popping back up on its half moon poles. We remained dry and the pegs, fabric and poles held without us lashing the remaining guys we had chosen not to secure. Our 2 person Hubba Hubba HP tent was chosen after much research with us being keen to find something lightweight, compact and with enough room so that living in a tent remains a pleasure, not just a necessity to avoid some of the elements. Similar weight yet it has twice the footprint of our previous euro hike backpacker tent, ….ok…also 10 times the price….the newly chosen having a door for each of us and sitting/ crouching room so we can dress simultaneously or go to the loo without waking each other in the night. Two things that make for much calmer relations when together 24/7. The tent has withstood downpours that intrude through our best gortex and the only moisture inside being from our own breath. Unfortunately the tent does not stop these vapours turning to ice although it is much warmer inside than out when taking refuge. We are yet to see how long the fabric lasts and how our Hubba stands up to heat and mosquitoes but so far so good. We also bought a vestibule , “Gear Shed”giving almost the same foot print again to store our luggage and for extra space in foul weather and use when staying somewhere longer than a day. At a push we could fit in bikes lying down. It’s been so easy to set up that we have used it every site to this point, with the exception of wild camping when stealth is our main priority. When the weather permits the use if pegs is not necessary for an even quicker departure. The tent comes in 2 colour options and yellow for us was definitely not a stealthy option. The green is adequate and really depends upon the environment. We have managed to blend in satisfactorily when wild camping however a darker green in Europe at the end of winter may be more appropriate camouflage. My coughing and Li’s sneezing a likely more of a flag to our whereabouts but as yet we have had no problems with detection including Germany where camping outside of designated sites is forbidden. I really enjoy this tent and hope it stands up to the next 18 months which will be the real test. I smile to myself as I remember my parents remark each time I left a door open….”do you live in a tent”……actually….yes I do! 3 Responses to "Our MSR Hubba Hubba HP tent review"
Makes me appreciate what creature comforts we take for granted here in Suburbia – like an electric blanket & a warm feather doona !